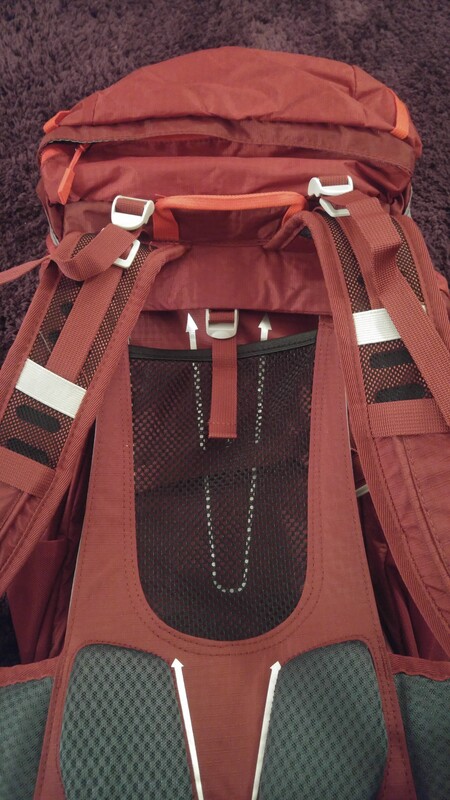 I like to know what all the straps and adjustments are on a bag but don't know what this one is on my OEX Vallo Air 28 from Go Outdoors. Is there a removable insert to keep the back rigid ? Either that or a water bladder pocket. The insert to keep the back rigid is accessible and removable from inside the bag rather than from the back. Same story with the water bladder pocket. I like a good mystery. What happens when you loosen the strap as far as it will go? You might have to drop a line to customer services. Not much, it just gets looser. Maybe it engages reduced gravity mode. Whatever it is suppose to do, it looks as if the buckle will be digging in the back of your neck / shoulders. The 'height adjuster' on my Berghaus pack is at the 'bottom' by the attachment of the waist belt to the pack. Brilliant. Looser for a longer back then I guess? I'd go with Sussamb on this one. I presume its there to help ensure the rucksack contours with your back. Its there so you can extend or shorten the back length so the hip belt fits over your hips properly. I often wish rucksacks and jackets would come with full instructions! The strap is to tension the internal support panel. When the strap is loosened it makes it easier to remove the internal frame. Although we do not recommend this. Shoulder straps don't look adjustable to me. I'd hazard a guess that their explanation is right and their website is wrong.